Worms is a very old town, rich in history. Worms was founded by the Romans. The Nibelung Saga took place here and later, after the founding of the (First) German Empire that is better known as the Holy Roman Empire of the German Nation many imperial diets took place in Worms. "Here I stand. I cannot do otherwise"
and was then subjected to the imperial ban. 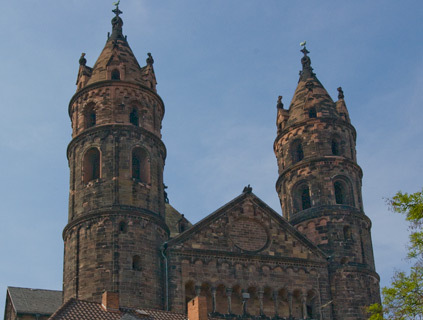 Worms Cathedral is a Romanesque cross basilica, built in the 11th and 12th centuries. 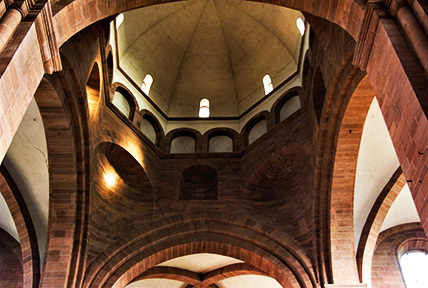 In accordance with its status as an imperial cathedral it was consecrated in 1018 in the presence of the Emperor. However parts of the cathedral collapsed as early as two years later and building had to be restarted. The cathedral was consecrated once more in 1110. Today the cathedral looks very much as it did when it was consecrated at that time but of course later periods also contributed something to its present structure. Further building took place on the cathedral during the Gothic period. 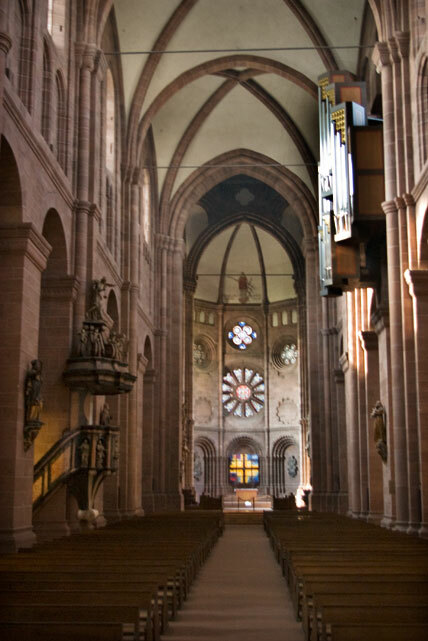 The War of the Palatinate Succession, up till then the most brutal war on European soil, devastated Worms as well and the interior of the cathedral. The French troops even wanted to blow up the cathedral but they didn't manage to. 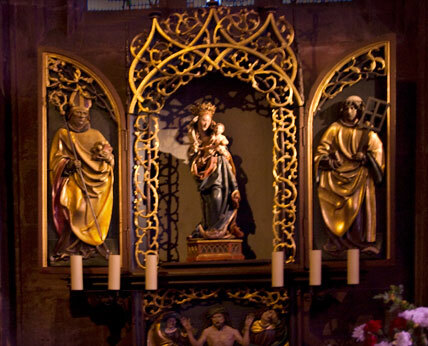 In the course of reconstruction, the Baroque high altar, made from gilded wood and marble, was put up by Johann Balthasar Neumann. The cathedral organ was only installed a few years ago. When the cathedral was built, church organs did not exist. 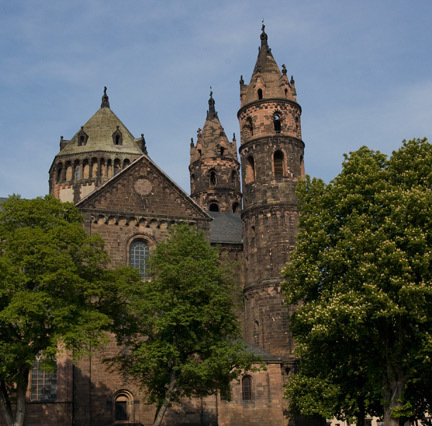 As Worms has not been a bishop's see for a long time, the former imperial cathedral is now only a parish church. But luckily the French troops were not able to destroy everything. 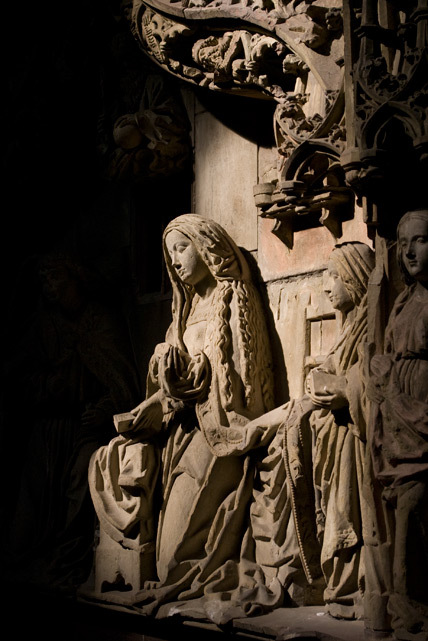 This side altar, highlighted by the afternoon sun, stems in the Gothic period. 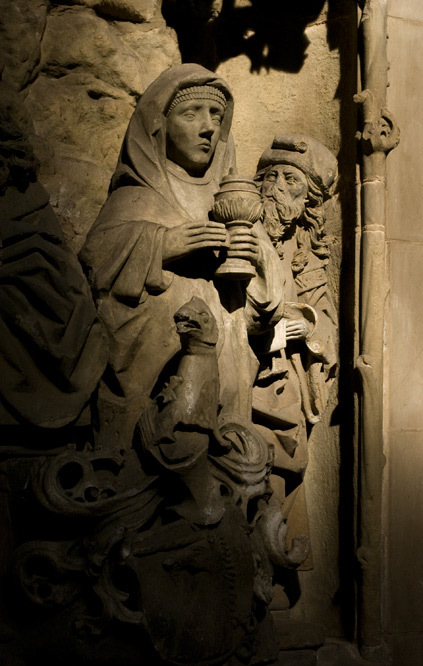 The afternoon sun creates magic light effects along the east wall of the cathedral into which old reliefs have been carved. During the French revolution and the occupation of the entire left bank of the Rhine in the German Empire by French troops, the cathedral suffered major damage again. The former Imperial Cathedral was degradated to a stables and storeroom. Even after the end of the Napoleonic Wars, a part of the German left bank area remained in French hands. When the German Empire ceased to exist in 1806 there was no emperor anymore to contend France's territorial claims. Germany was subsequently broken up into small areas at the Congress of Vienna. 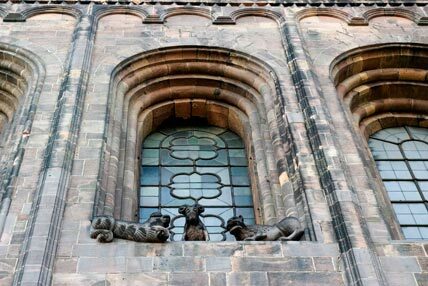 The presumably very beautiful cloisters were gradually taken down by the French between 1818 and 1830 and their stones sold for public use. In contrast to the cathedral at Speyer in which many emperors have been buried, no emperors were buried at the Imperial Cathedral of Worms. 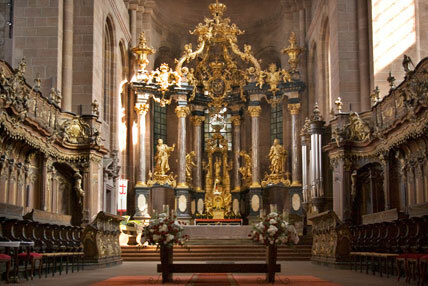 However many relations of Emperor Konrad II were buried there. 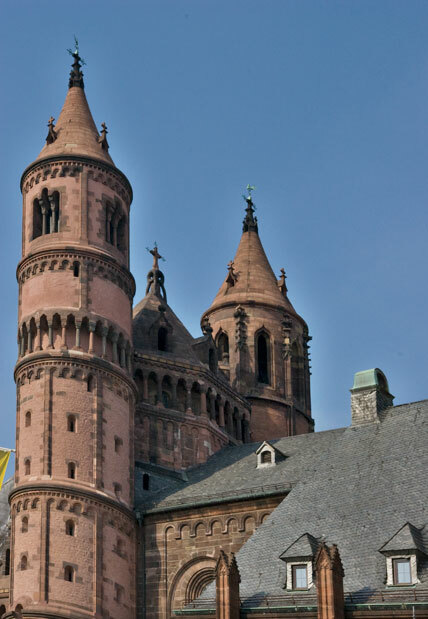 Worms Cathedral is situated on the highest hill of the town and is hence safe from flooding from the River Rhine. This hill was the site of settlements even in primeval times. During the Roman era, the hill was a forum and later the first Christian church followed. This is where the Imperial Cathedral stands today. The cathedral also plays an important role in the Nibelung Saga. Apart from the cathedral there are also other historical buildings and parts of the old town walls to see. Among these is the Town Gate. It was through the side gate for people on foot that Martin Luther left Worms after the imperial ban had been declared. The former imperial cathedral forms the center of the town today. Of the earlier surrounding buildings almost none is still standing today. Worms was destroyed considerably during the Second World War. Even the cathedral was hit by several aerial bombs which were luckily not able to destroy anything in the interior. When Worms was rebuilt from the ruins of the Second World War it was in a bland, functional, post-war style. Sadly this detracts much from the impressive form of the Imperial Cathedral today. Nonetheless, the Cathedral is still worth visiting, not only because of its past but also because large Romanesque structures in their original form have become so few and far between.